I’ve worked at many places, ranging from startups to Fortune 500 companies. Most described themselves as having a “family-style culture.” They had happy hours, brought cake into work for birthdays, and hosted bring-your-kids-to-work days. In my mind, those activities are commonplace and loosely categorized as family-like. When my cofounders and I started Enplug, we wanted to create the ultimate family culture. We took what it meant to be a family to the nth degree. Working well together in the office is a responsibility. Working and living together is a commitment. Although we have a spacious office, one-third of the company share a home in Bel Air. I live there with my cofounders and several teammates. We share the bathrooms, kitchen, washing machine, gym equipment, and food. We carpool to work, which is 12 minutes away, and watch TV in the living room when we get home. Photo: Colin and I playing music in the kitchen; eating lunch on the weekend in our backyard. Every time a teammate has had a wedding, they have invited the whole team. Most recently, a bunch of us drove from Los Angeles to San Francisco for our team member Shawn’s wedding. Shawn wore an Enplug shirt to his wedding rehearsal and tweeted about it. We loved celebrating this milestone with him and his bride, Tiffany. At the reception, Enplug teammates took up nearly half of the tables. 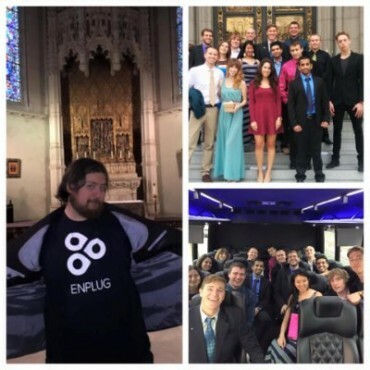 Photo: Shawn wearing an Enplug shirt at his wedding rehearsal; teammates at the wedding and in the party bus. 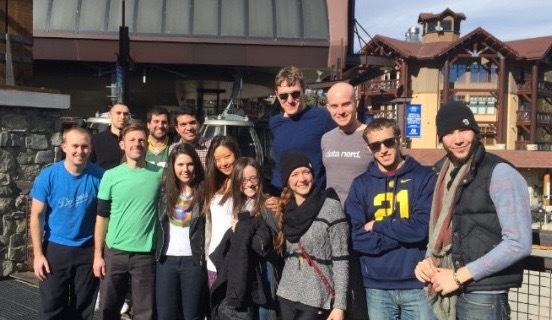 Like many tech startups, our team’s average age is younger than most corporations. Instead of having a bring-your-kids-to-work day, our teams brought their parents to the office to meet their extended family (Enplug). When our team mate Josh’s parents visited from Arizona, they stayed in my bedroom, since I was out of town. Not only that, but also our CTO Tina and Chief Software Architect Bruno joined us one week after they got married. They lead our engineering team. Before moving to their cozy home in Marina Del Rey, Bruno and Tina lived in the Enplug house with us for a year. Company retreats usually mean traveling somewhere remote and having your own hotel room. When we go on family vacations, we crowd everyone into one room. For Enplug’s ski trip to Mammoth, we booked one large hotel suite. When it was time to go to bed, we played a game of Tetris for floor space. When tax season rolls around, we help each other with filing taxes. Sharing your income is taboo in the traditional workplace. But just like my parents always discussed their finances, our teammates are open about money with one another. We’re also transparent about Enplug’s own company finances. Everyone knows how much money we spend each month and how much revenue each sales person brought in. We enjoy our sit-down dinners together. We cook meals for one another and bring friends over for the festivities. We also have a grocery list so that any teammate can add foods or snacks they’d like to have. Photo: (left) My dad invited Colin’s family over for dinner since they all live in Colorado. (right) Dinner at the Enplug house. We turned our old conference room table into the dining table. Okay, so maybe we take what it means to be a family a little farther than most companies would feel comfortable doing. But our tight-knit group is what’s made our product and company successful. You know how they say you don’t choose your family? Well, at Enplug, we chose ours. Versions of this post previously appeared on the author’s LinkedIn and on BusinessCollective. Nanxi Liu is the cofounder and CEO of Enplug, a Los Angeles technology company that builds the industry-leading software that powers digital displays in malls, restaurants, retail stores, and more. Marriott, Posche, and 350 companies around the world use Enplug’s software to showcase real-time and interactive content on their displays, including RSS feeds and social media. Enplug was named one of Entrepreneur Magazine’s Top 30 Startups to Watch and Inc. Magazine’s Top 5 Women-Led Startups to Watch. Nanxi is also founder and board member of Nanoly Bioscience, which developed a polymer that enables vaccines to survive without refrigeration. Nanoly was awarded as one of NASA’s Top 10 New Tech Companies and as Intel’s Top Social Innovation.